Coding for the IRF-PAI can be tricky proposition. From learning and applying rehab specific coding rules to choosing an etiologic, Case Mix Groups, and everything in between, inpatient rehab coding can be tough. The coder must make a lot of difficult calls. 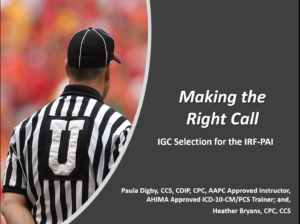 In this session we will be discussing what is for many the toughest call to make in rehab – choosing the correct Impairment Group Code or IGC.